The 47th Annual Maryland Seafood Festival (MSF) celebrates a weekend of fresh and mouth-watering seafood on September 6 and 7th, along with a variety of entertainment, exhibits and activities. “At last year’s event, we enjoyed two beautiful days that provided record breaking crowds on the picturesque shores of the Chesapeake Bay; we all enjoyed the atmosphere, food and exciting entertainment,” notes Stephanie Duncan Troxell, spokesperson for the MSF. This year, the event will entertain attendees with new and exciting exhibits, sponsor booths, food vendors and thrilling activities, all to provide a full day of fun by the bay. The professional EVP Beach Volleyball Tour will hold their Eastern competitionat the festival and is expanding to ten (10) courts of competition on the festival beaches and grounds while the Maryland Watermen Association will be racing Chesapeake Crab Skiffs on the bay. New this year is the professional pogo stick demonstrations from Xpogo, who travel throughout the country thrilling spectators with their high energy bouncing and unique tricks. Watch for them as they have moved to the 2nd round of America’s Got Talent. Shore side, youngsters and adults will be enthralled with the Crab Derby coordinated by Crabs for Kids as well as the opportunity for youth to create a keepsake piece of art by painting their own unique pattern on a crab shell. For Festival competitors, sign up for the Crab Cake Eating Contest, the Crab Picking Contest, sponsored by Canter’s Riverside Restaurant or the Oyster Shucking Contest or just relax with the audience while cheering for your favorite competitor. For those interested in crab soup, buy your ticket for the popular Capital’s 25th Annual Crab Soup Cook-off on Saturday and on Sunday, we are pleased to again be hosting DNR’s Maryland Fishing Challenge featuring the Diamond Jim Awards Ceremony. 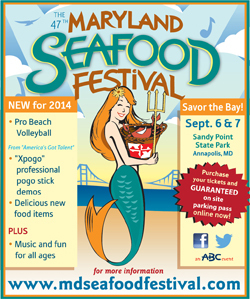 The Maryland Seafood Festival is known for showcasing the best seafood the Chesapeake region has to offer. “Foodie Treasures from the Bay” will include crab and oysters as well as other seafood and landlubber delicacies; all sold by professionals, non-profits and new food vendors from the Annapolis area and the Eastern Shore. On the Miller Lite Main Stage, the musical line-up includes festival favorites- Kelly Bell Band, the Dublin Five and the Shatners, along with the new, soon-to-be favorite, the Leaf Jumpers from Connecticut and more. To fulfill our mission, MSF is excited to support many non-profits including the Chesapeake Bay Trust, a nonprofit, grant-making organization dedicated to improving the Chesapeake Bay and the Walk the Walk Foundation, helping those in need with basic necessities through giving resources as well as other charities. “Walk the Walk is thrilled to partner with the MSF this year. We are excited to share who we are and what we do through our programs. MSF attendees can join us as we strive to make a difference for children & families in need” notes Executive Director, Chelsea MacCubbin.